I am not too famliar with the cafe culture but I was here due to an event party. However, the overall experience once again convinced me of the extremely slim hopes of finding good food in café. One can spare Spam Chips ($9) the accusation of being too salty since it's churned from the can (blame the manufacturer) but not for the Corn Beef Hash ($12), a brunch item that consists of salt-cured minced beef with two poached eggs. Even the accompanying sourdough were unable to divert the attention away from the sodium. The half-hearted Cheesy Fried Chicken ($18) which resembled the standard chicken cutlet set from the western stall at hawker centers, failed to impress with an awkward cheese blanket. The chilli powder did not impart any spice to lift up the fried fries in any way. The Cheeseburger ($18), an 180g beef patty on bun, remained dry and lifeless even though there was some melted cheese concealed within the meat. The homemade buffalo sauce for the Buffalo Wings ($12) had a lingering aftertaste of spice but made the wings too cloying to encourage a second piece. 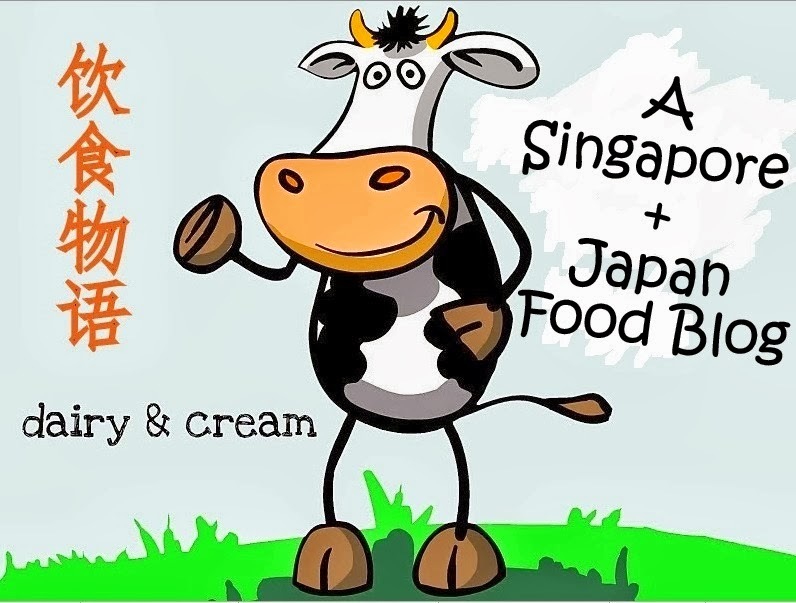 I sometimes wonder if I should abstain from trying the cakes in Singapore as the more I try, the more pessimistic I become. Same goes for the desserts here. The Red Velvet Cheesecake Brownie ($8) could not command any feelings of awe, but at least they were fared better than the version from Seasons Bistro. As for the lemon tart ($9), the shell hasn't attain the full technical excellence of a classic French rendition. Fortunately, the coffee, be it cappuccino or mocha, had gained the thumbs of approval from many coffee aficionados that I knew. Though I can't tell much about coffee, I took a sip. And I quite enjoyed it. Looking for some value-for-money dinners deals in town? Dine with American Express Card at any of the 30 restaurants under the AMEX 30-licious promotion and enjoy scrumptious feast at only $30 for 30 days! One of the highly recommended restaurants on the list is Spruce, a 6-year old modern American restaurant that is surrounded with lush greenery in Phoenix Park. The #30liciousAmex here features a House Salad, a Main and choice of beverage (coffee/tea/soft drink/in-house lemondade above) The House Salad is a class of its own , relished with truly sweet juicy tomatoes and unique champagne dressing that has a nice vinegrette tang to perk up our appetites. For the mains, the pastas are really the showstoppers, because they were so confidently delivered that you thought you were dining in an authentic Italian trattorias. The Signature Prawn Pasta looked like anything, but a prawn pasta. This inventive dish born out of Spruce's first-generation American head chef to mark its opening, has been a popular mainstayer on the menu. Luxuriously coated with spinach and zuchinni puree, the orecchiette (cat-ear) pasta is tossed with chopped sea prawns and savoury zucchini bits. Brilliantly peppered with grana padano cheese, the flavours are superior than an average basil pesto pasta; strong, garlicky without letting your fork paused for any moment. This is probably the tastiest prawn pasta I've ever had. The Squid Ink Pasta Carbonara is also too good to share. Being a carbonara fan, there have been many scary encounters of bad cabonaras being either too watered-down or too dry. This achieved the right consistency, though it could be less salty since there were already rewarding amounts of smoky bacon in the creamy swimming pool. The oven-roasted Chicken Pullet might not eclipsed the pastas in terms of richness in taste but it does have the power to win on its natural flavour. Served with rosemary velouté sauce, the effect is of simplicity rather than showiness. Desserts are not available as part of #30liciousAmex but if you like to have a sweet ending like me, there is a simple yet achingly fragrant Pandan Creme Brûlée. The Baked Ginger Date Pudding (below) is not too intimidatingly dense as the classic American sticky date pudding. Fluffy with undertones of ginger, the cake itself was, in fact, not sweet unless you lap it up recklessly with the Kapiti Ice Cream and chocolate toffee sauce. Alternatively if you prefer a course that has a dessert, head to the Firestation Outlet where its lunch promotion features a choice of drink, side salad with different menu for mains (roasted chicken/vegetarian pasta in Aglio Olio or Tomato base) and a dessert of chocolate cake. This double layer chocolate sponge inter-layered with a winning salted caramel sauce and crunchy chocolate pearls was served chilled, a pity because the smooth texture was locked up a solidified form and the sponge lost its moisture. Besides the food, the Phoenix Park outlet actually houses a playground, a courtyard and an alfresco area that can total accommodate nearly 200 pax. No wonder it has been a popular location for families and events such as garden theme weddings or solemnization. But all these plus points will not distract me from the fact that Spruce dishes up solidly good mains. This reality alone, is sufficient to bring me back for more. Craving for that sweet nibblings to reward yourself after a day's work? Or looking for some cakes on a Sunday afternoon but too lazy to step out of house? 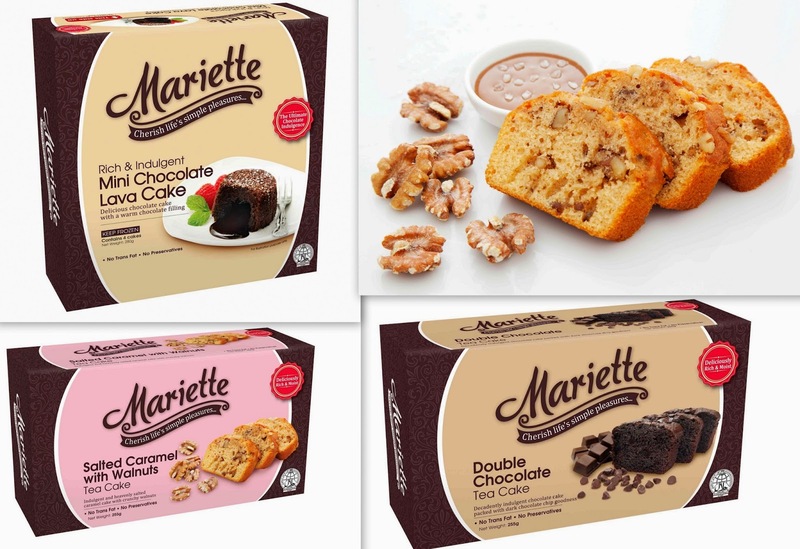 Auric Pacific Group, the company who owns famous family brands such as SCS Butter or Sunshine Bread, launches Mariette, a new series of Halal-certified tea cakes that are ideal for instant gratification! Let me start with my favourite flavour, Salted Caramel with Walnuts Tea Cake. This longstanding sweet-salty flavour could do with a little more salt, but it's nutty butterscotch taste makes this dangerously addictive. As for the Double Chocolate Tea Cake, it is truly decadent and moist, studded with beautiful dark chocolate gems. For a pick-me-up in the office on a particularly dour day, I will think of this tender and refreshing Orange Peel Tea Cake. The tartness is well regulated and one could wash it down with a cool ice lemon tea. As the first microwaveable Molten Chocolate Lava Cakes (4 in a box for $7.90) to hit the local supermarkets, these demure little desserts with a supple brownie-like crust come alive with a rich, chocolately, molten center. The trouble is, if I served these during party, chances are the guests wouldn't quite recall what they had for their main courses. All they remember are these outwardly humble, internally voluptuous chocolate cakes. 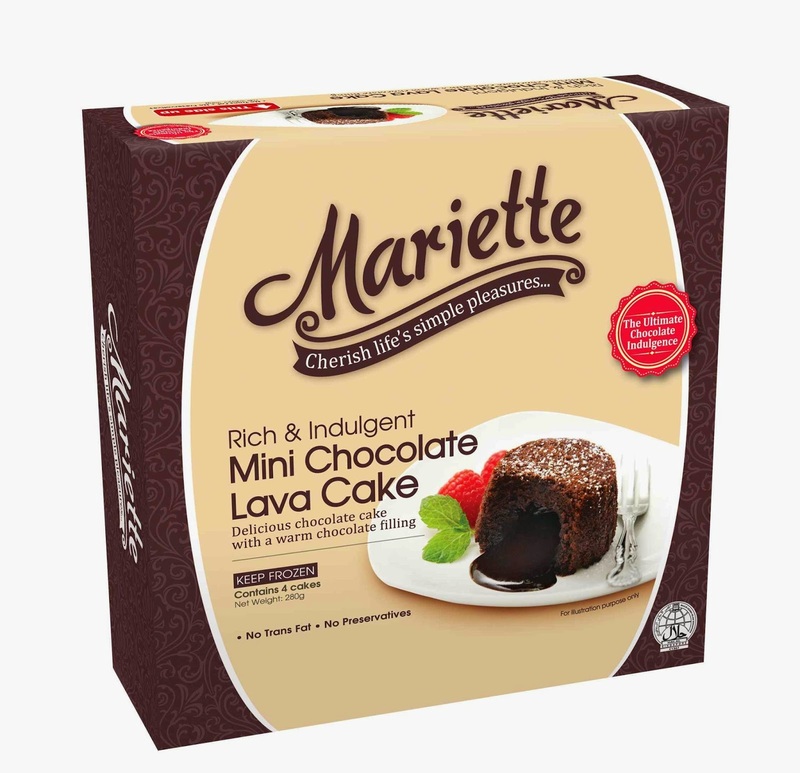 All Mariette products contain NO TRANS FAT, NO PRESERVATIVES, which suggest that I may have a valid excuse to indulge more? Nonetheless, some might be concern about the sweetness and expressed that the texture has potential to be more refined. Cold Storage and Giant Supermarkets for $7.90 each. This wasn't immensely pleasurable despite the fact that it was matcha. Too much of the white chocolate could have spoiled the broth. Still, I smiled in delight as I discovered the generous mount of red bean in the center. I have not tasted hibiscus in my life so I can't determine fairly whether the flavour of hibiscus mousseline is sufficiently intense but the juicy fruit rouge was a nice contrast to the sugary macaron. That said, there was no surprise element. It was simply a slightly bigger macaron fruit sandwich that can be found at other patisseries with an even more precise execution. I couldn't leave without this as it is such an exotic species from the PH Emoticon Series. WASABI...yes finally something different. Wasabi Gelee, Wasabi Mascarpone Cream, Grapefruit Confiture, Biscuit sponge and Matcha Marshmallow. The double wasabi effect from the jelly and the cream did hit the nose but still tolerable. With the bitter taste of the grapefruit and melt-in-your-mouth matcha marshmallows, the creation left me rather dumbfounded as all the different tastes and textures kicked in. Possibly the most bizzare PH dessert but I like it. I am not a fan of PH macarons but occasionally, I would still be drawn to some flavours that perked my interest. For instance, the wasabi cream in Macaron Delicieux had an unexpected grapefruit confiture. And the Macaron Mosaic is cinnamon-infused pistachio ganache with cherry griottine. I have not come to appreciate the texture of PH macaron shells, but I have found a better way to enjoy them; leaving them at room temperature till the filling becomes softer and let the entire thing crumble in your mouth. It does require some patience, but it makes a huge difference. Last but not least, the Herme Carre Envie was one of the items from FETISH ENVIE. FETISH is a seasonal rotating theme that focused on a specific flavour. 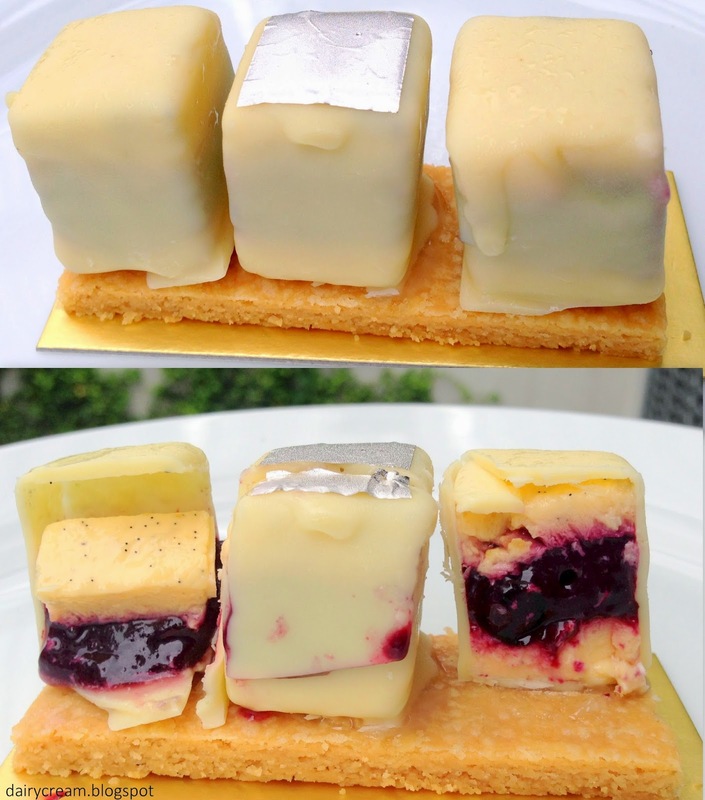 Encased within each white chocolate square is sour cassis compote hedged against violet-accented vanilla crème brulee. Delicately perched on a lightly salted sable Breton, the chocolate squares were endangered by the hot summer weather but I salvaged the mess perfectly without leaving any trace behind. If you have not try any single pastry (say Millefeuille) from Pierre Herme yet, it is time to do so. Caramelized puff pastry, Strawberries, Mango, Red Pepper Mascarpone Cream. Framboise Financier, Pastry Crème mixed with Confiture of Orange, Grapefruits, Figs and Apricots, Orange Brioche Crème Brulee. Citron Mousseline, Citron Biscuit blended with Olive oil, Fruit Rouge Compote, Melange, Biscuit.